The challenge was huge but it was worth it! The first running of the Fafe World Rally Sprint, held ahead of the 2012 Vodafone Rally de Portugal, achieved its goals and everyone, including teams, drivers and officials from the FIA, witnessed the return of modern rallying to one of the nation’s most famous venues. Last year, the Fafe/Lameirinha stage was the scene of a rare occasion, as the drivers, inspired by the spirit of one of the most iconic stages in rallying, delivered action and excitement which upheld the honour of the legendary venue and delighted the hundreds of thousands of passionate rally fans. Based on this success, there was only one option for 2013, as Pedro Almeida, Clerk of the Course says: "Run it again! The rally fans deserve it and we are determined to retain this genuine 'appetizer' for the rally, in the certainty that the success will be at least equal to, or even greater than, last year. Fortunately our intentions were welcomed at the Fafe Town Hall, whose support is essential, as well as the manufacturers, who again agreed to take part in this unique challenge." The organizers of the 2013 Vodafone Rally de Portugal can therefore confirm that the three official teams present at the rally - Citroën Total Abu Dhabi WRT, Qatar M-Sport WRT and Volkswagen Motorsport - will also be present in Fafe on April 6, guaranteeing an even more impressive spectacle for the second running of the event. All the works drivers will be competing to succeed Petter Solberg, who won the inaugural event in 2012 and add another honour to their resume. José Ribeiro, Mayor of Fafe, said; "The success of last year’s event, run with our full support and co-operation, reminded the rallying world of the rich heritage of Fafe and the part it played in the history of the sport. We demonstrated that the natural conditions that made Fafe the ‘Cathedral of rallying' remain unchanged. Fafe is ready to welcome the teams, drivers, co-drivers and of course, rally fans with enthusiasm!" 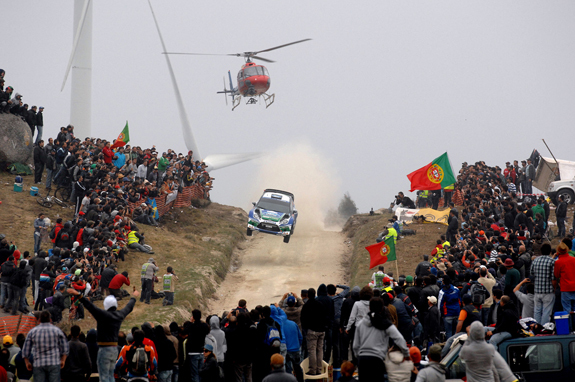 The Fafe World Rally Sprint will take place on the Saturday prior to this year’s Vodafone Rally de Portugal - 6th April 2013 - in the iconic setting of the Fafe/Lameirinha test, using the last six kilometres of the original stage. Running as a genuine timed special stage, the event will consist of two qualifying heats and a final, where only the fastest drivers will compete. The paddock will be located in Fafe's Parque da Cidade, next to the Multipurpose Pavilion.